PODCAST 182 GOES BY IN A BLINK OF AN EYE! 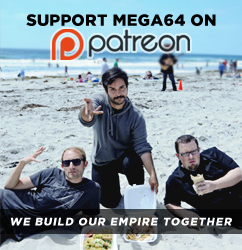 Well, it's been a very busy week here at the Mega64 Studios, and with E3 coming up it's going to get even busier! In this podcast I think we all know what we're gonna talk about... Blink 182!!!! We talk about what Tom, Travis, and Mark are up to these days!!! Plus, we name off, in order: The best to worst all of their songs!! Oh wait, I forgot we also talk extensively about our newest video ""KOJIMA'S SECRET" (Kojima Productions E3 Trailer)" We go into all that went into making this super secret video! I don't think we have ever gone into so much detail on making a video ever. So enjoy!!! Listen to it here! That's all for now but keep coming back for all our E3 news!